Mars rover tracks within Gusev Crater show what may be water squeezed out of the soil by the weight of the wheeled Spirit robot. The water subsequently freezes into a whitish residue left in wheel marks. DENVER, COLORADO - Those twin robots hard at work on Mars have transmitted teasing views that reinforce the prospect that microbial life may exist on the red planet. Results from NASA's Spirit and Opportunity rovers are being looked over by a legion of planetary experts, including a scientist who remains steadfast that his experiment in 1976 proved the presence of active microbial life in the topsoil of Mars. "All factors necessary to constitute a habitat for life as we know it exist on current-day Mars," explained Gilbert Levin, executive officer for science at Spherix Incorporated of Beltsville, Maryland. Levin made his remarks here Monday at the International Symposium on Optical Science and Technology, the 49th annual meeting of Society of Photo-Optical Instrumentation Engineers (SPIE). Levin has a long-standing interest in time-weathered Mars and the promise of life today on that distant and dusty world. NASA's 1976 Viking mission to Mars was geared-up to look for possible martian life. And it was Levin's Labeled Release experiment that made a provocative find: The presence of a highly reactive agent in the surface material of Mars. Levin concluded in 1997 that this activity was triggered by living microorganisms lurking in the martian soil - a judgment he admits has not been generally accepted by the scientific community. Now roll forward to 2004. Consider the findings of Spirit and Opportunity, the golf-cart sized robots wheeling over Mars at Gusev Crater and Meridiani Planum. "Those rovers have been absolutely sensational, pouring out thousands of images. Those images have lots of information in them. And I've tried to deduce something in there relative to life...and I think I found a lot," Levin told SPACE.com. In perusing rover imagery, Levin reports there is clear evidence for liquid water existing under Martian environmental conditions. "The images should be reviewed against the background of surface temperatures as varying from below to above freezing reported by both Spirit and Opportunity," he explained. Levin points to the potential for mud puddles on Mars, showing an image of clearly disturbed martian soil after rover airbags bounced across Mars' surface. Possible standing water and sinkholes can also be seen in rover imagery, according to his analysis. In some pictures, the often-discussed "blueberries, " tiny spheres of material, disappear as if submerged underneath mud-like surroundings, he added. Then there are tracks left by the machines as they roll across the martian terrain. Self-taken shots by the robots show what Levin said appears to be water squeezed out of the soil which then freezes into a whitish residue left in embedded tread marks. 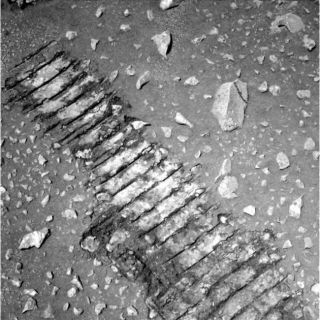 Similarly, Levin added, are images taken by Opportunity of the results from an operation of the robot's Rock Abrasion Tool, or RAT. The center of that particular RAT hole is largely white, possibly indicating the formation of frost since the hole was drilled, he noted. "The evidence presented strongly indicates the presence of liquid water or moisture at the Mars Exploration Rover sites," Levin reported at the SPIE meeting. "Mars today could support many forms of terrestrial microbial life." Other scientists are cautious to point out that the presence of water does not guarantee life. Rather, it means one crucial ingredient exists. There is clear evidence for frost or ice on Mars, the former Viking experimenter stated. At some point of the day -- when temperatures climb above freezing -- there's going to be moisture..."and that's enough to support microorganisms," he said. None of the many new findings about Mars revealed by Spirit and Opportunity, Levin concluded, conflict with, or render untenable, his long-held belief that the Viking Labeled Release experiment in 1976 detected living microorganisms in the soil of Mars. "I contend that today you could take a great many Earth microorganisms, put them on Mars, and they'd grow," Levin said. "And I think there are organisms there now. They may have come from Earth. They may have originated on Mars. They may have come from a third place that populated both Mars and Earth." Rocks can be kicked up from one planet by an asteroid impact, drift through space for eons, then land on the other. Other studies have shown that these rocks could potentially transport life, in a dormant phase, from one planet to the other. Levin said that he thinks the "greatest speculation" would be to say there can be no life on Mars. If indeed Mars is rife with life, care should be taken in hauling back to Earth specimens of rock and surface materials from the red planet. NASA has indicated that, next decade, robotic craft could be dispatched to gather and return to Earth select samples of Mars for detailed laboratory study. Could those bits of Mars, perhaps laden with martian microbes, act as dangerous cargo? As a precaution, Levin advocates a kind of bio-shield strategy for Earth - but using the Moon. The new NASA vision to reestablish a human presence on the Moon is good timing, Levin said. "Bring samples of Mars not to Earth but to the Moon," he said. "There we would have built a scientific laboratory in which scientists could examine the samples and determine whether or not there is a hazard."